Let’s not sugarcoat this: Dead 7 is a deeply, powerfully stupid movie. It’s the kind of film where, when a character is all alone and his gun jams, he yells out loud to himself, “My gun is jammed!” It’s the type of film in which—despite being decades into the collapse of civilization and the subsequent return to an Old West landscape—a man has to patiently explain to a woman how currency works. A character tells a nervous guy, “They’re never gonna get us,” literal seconds before they get him. In short, it’s yet another entry in the Syfy canon of low-budget crapfests produced by schlockbuster studio The Asylum, in hopes of hitting that “so-bad-it’s-good” sweet spot for these genre exercises. And occasionally, Dead 7 actually manages to clear the bar for passable lunkheaded entertainment, like a drunken long-jumper tripping and landing far enough ahead of himself to convince those in the cheap seats he meant to do it. But no one’s here for cinematic quality. This movie got made on the basis of its cast, a who’s-who of boy-band notables from the turn of the century. Spearheaded by executive producer and star Nick Carter, nearly every role of note goes to an ex-member of a once-massive pop-group assembly line, including ’N Sync (Joey Fatone, Chris Kirkpatrick), The Backstreet Boys (Carter, A.J. McLean, Howie Dorough), 98 Degrees (Jeff Timmons), and O-Town (Erik-Michael Estrada, who probably endured lots of taunts on set for being in O-Town, the White Castle of boy bands). There are strange cameos from Everclear’s Art Alexakis and American Idol’s Frenchie Davis. It’s another Sharknado-style exercise in rubbernecking at the ludicrous roster, only without the hook of a premise so dumb it becomes transcendental, something to chant during your zen meditation. Once the initial look-at-that fascination of seeing former teenybopper music stars goofing around on a Syfy production wears off, all that’s left is the movie. Thankfully, it passes by quickly, and with enough “oh, you’ve gotta be kidding me” moments of dimwitted absurdity that it earns its stripes as something you may enjoy, given a passel of friends and enough alcohol to kill a team of oxen. (If you’re attending a viewing party, I’d recommend calling dibs on any bottle that has a handle as soon as you arrive. It’ll ensure you attain the proper intellectual level, which is best defined as “sub-verbal.”) Dead 7 is essentially a Magnificent Seven ripoff, broken into seven chapters. When a character explains his plan at the end of chapter one to assemble a team of desperate gunslingers to take out the baddie amassing a zombie army, you barely have time to think, “Oh, they’re just ripping off The Magnificent Seven,” before the title of chapter two appears onscreen: “The Magnificent Dead 7.” Okay, then. The narrative, such as it is, recounts the tale of a small town under threat from Apocalypta, a woman who commands a group of outlaws helping her assemble an army of zombies, which they then use to raid villages and wipe out the population. The town deputy puts together a rag-tag (but surprisingly honey-voiced) team of sharpshooters and warriors to climb the mountain that houses this Cesar Milan-esque zombie whisperer and take her down for good. Along the way, they have a couple of shootouts, visit a brothel, and more than a few moments of wildly unnecessary ADR. (“They went through these doors,” someone overdubs during a chase, to make certain the audience is properly prepared for our heroes to then walk through those same doors, something that would presumably incite riots were we not adequately prepped for such a bold choice.) The opening credits tout “Story by Nick Carter,” leading to the inevitable question of which came first, the time Carter saw a zombie movie or the time he saw The Magnificent Seven. 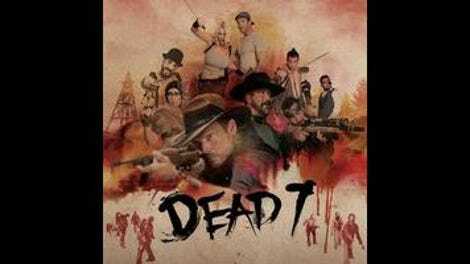 Dead 7 provides a buffet of non-actors acting, to varying degrees of success. The best of them dive into their roles with the right amount of hammy abandon, none more so than Backstreet Boy McLean, who basically plays his white-faced villain like a southern-fried version of The Joker. (Although Mad TV’s Debra Wilson gives him a run for his dubloons as Apocalypta, a role she plays not so much by chewing the scenery as by grounding it to powder and freebasing it.) Joey Fatone mugs shamelessly as a character named “Whiskey Joe,” and Estrada and Dorough acquit themselves reasonably well. The women are few and far between, with the exception of Carrie Keagan’s enjoyably goofy Daisy Jane, and the designated mystical badass, played by Lauren Kitt Carter, Nick’s spouse. Given that every other woman is either a prostitute or essentially “attractive onlooker,” it’s not shocking the film follows a common Asylum habit, wherein Russ Meyer’s ghost seems to be the casting director. But perhaps the oddest choice is made by Carter himself, who plays his role completely straight, glowering and stoically delivering lines like he wandered in from a Sergio Leone film. Long stretches of Dead 7 are stultifying, unless you have a fondness for bad dialogue, delivered awkwardly. One scene between Estrada and his love interest is practically a contest to see how many verbal exchanges that should function as scene-enders can be followed by needless variations of the same basic information. Lines are often spoken for no apparent reason other than to trigger the next action, regardless of whether it makes sense. (“Apocalypta—she’s here.” “She’s everywhere.” What? No, she isn’t.) Thankfully, there are enough scenes of oblivious absurdity leavened throughout to make up for the dull periods. At one point, Fatone’s Whiskey Joe leads a retreat from a house, as its denizens load up on guns and yell, “Don’t let them escape!” At which point the armed baddies stop at the front door and… let them escape. For no discernible reason. It’s not quite “I definitely have breast cancer”-level unfathomable, but it’s not far. Stylistically, the film is also a ripoff, though not of a classic Western, but of Z Nation, The Asylum’s zombie-apocalypse series that has managed to overcome its bargain-basement pedigree and become tremendously entertaining. The rapid-fire edits, CGI zombie executions, and grindhouse-aping shtick, all borrowed from that program, keep the story fleet and moving, though with none of the surefooted direction of Z Nation. Dead 7’s helmer, Danny Roew, often has trouble establishing basic things like geography and composition, with most action scenes rendering it all but impossible to know where any character is in relation to anyone else. (A veteran of multiple seasons directing Big Brother, perhaps he’s gotten too used to inexplicable behavior that never properly justifies itself.) Most of Apocalypta’s scenes are retreads of her first appearance, save for the final showdown, and one moment in which she licks blood out of a zombie’s mouth, something that should trigger concerns about sanitary regulations in her compound. But that last fight delivers a good body count among hero and villain alike, and some of the ways the undead are dispatched provide a little visual pop to the proceedings. Much like any other Syfy film, and exactly like any other Asylum film, the movie’s entertainment value depends wholly upon your tolerance, even fondness, for lack of quality, rather than the reverse. Ultimately, Dead 7 suffers from the same flaws as the majority of the channel’s made-for-TV genre flicks: They want to be Roger Corman fun-fests, but they can’t stop with the postmodern winking and pastiche, and the creative team behind them doesn’t have the chops to pull off that balancing act. It’s a silly and harmless way to pass the time, but it’s also forgettable. Bye, bye, bye, Dead 7.